There are many listings that are either counterfeit or marked up in pricing. 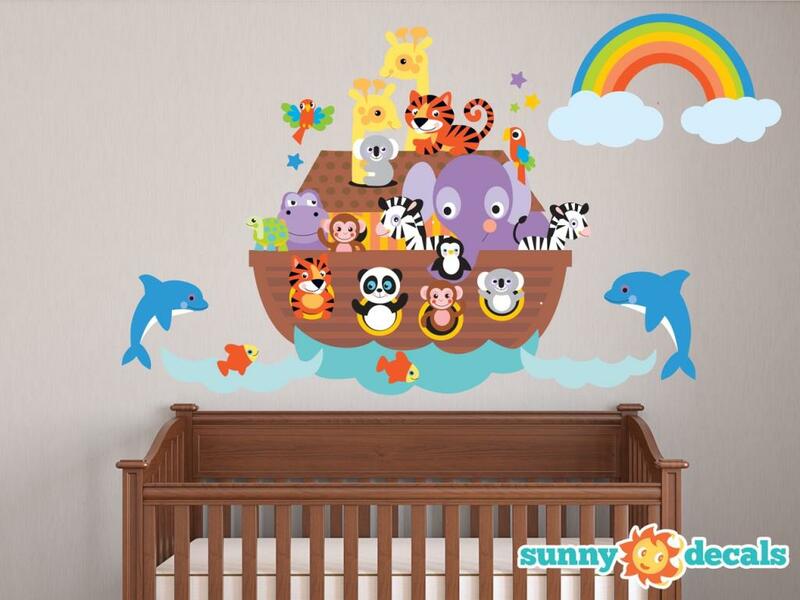 The Noah’s Ark Wall Decals offers the grand opening for you to take the first step in your great voyage! Do not hesitate to take your kids under your wings and walk with them in the corridor of time to the ancient era of Noah. Tell them the fabulous story of Noah - the man who impressed The Almighty God in his acts and life style. Show how the wrath of God was meted upon the sinful mankind and the entire world and how the endless love of Him saved the ungrateful world through a single devout man and the chosen species. This colourful wall decal will add a dramatic aura to the room during short spiritual and intimate sessions with your children. Let your kid nourish not only his soul but also his knowledge of different animals and birds while living in his own ark. 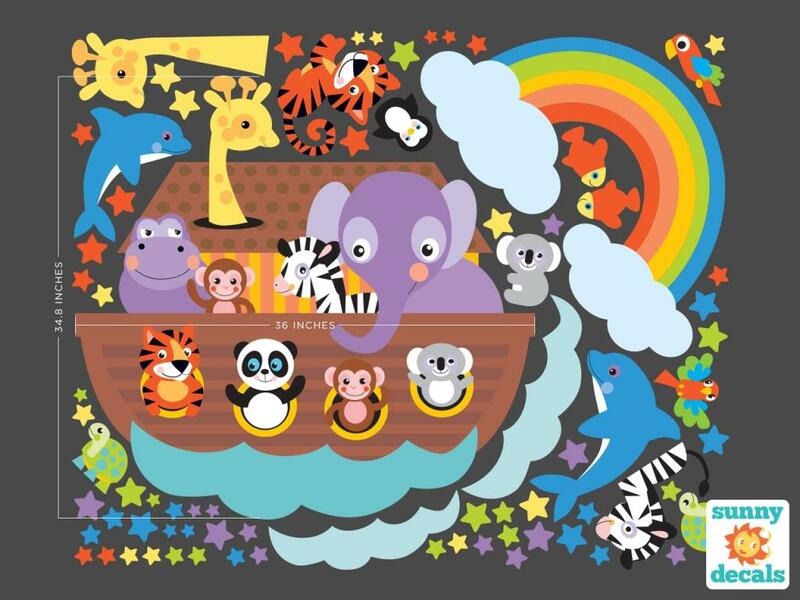 You could engage them in small mind challenges by asking them to point the animal or bird you say on the Noahs Ark Wall Decals. Increase the enthusiasm and sense of time by allocating a specific period for each search. Your kids will also love to play with the cute animals on the decal on their own. All you have to do is to place your order now and let your kiddies’ imagination go wild with excitement. This decal perfectly blends in with any light colour interior wall and can be used for both boys’ and girls’ rooms. Ideal to brighten up an empty wall of a child’s bed room, playroom, nursery, school, indoor play ground or anywhere kids love to play; with a minimum impact on your wallet. Capture the magic of decorating with Sunny Decals’ fanciful designs and whimsical scenes. Sunny Decals has hundreds of colorful and easy-to-apply fabric wall decals that will help you turn any drab wall in your house into a decorative masterpiece. Cost effective, non-toxic, and safe for kids! Our decals are made from a polyester fabric material that has a matte finish and will look like a painted mural on your wall. All of our products are made to order and 100% American made. Safe For Kids. Made in U.S.A.
*This product usually ships within 1 business day after your order is placed. (excluding Saturday & Sunday). *Domestic USPS 1st Class Mail = Normal Delivery time 2-7 business days and 14-30 business days for international shipping. In some cases, it may take longer due to delays in customs. *International buyers please note: You are responsible for any and all customs and/or duties resulting from importing your purchase into your country. These charges are not included in the final bid price or the shipping/insurance price. Questions about these additional fees should be addressed to the international bidder's specific government agency relating to importing and customs practices. *California residents are subject to 9% California sales tax. Our 100% satisfaction guarantee represents the pride we take in our brand, products, and services. 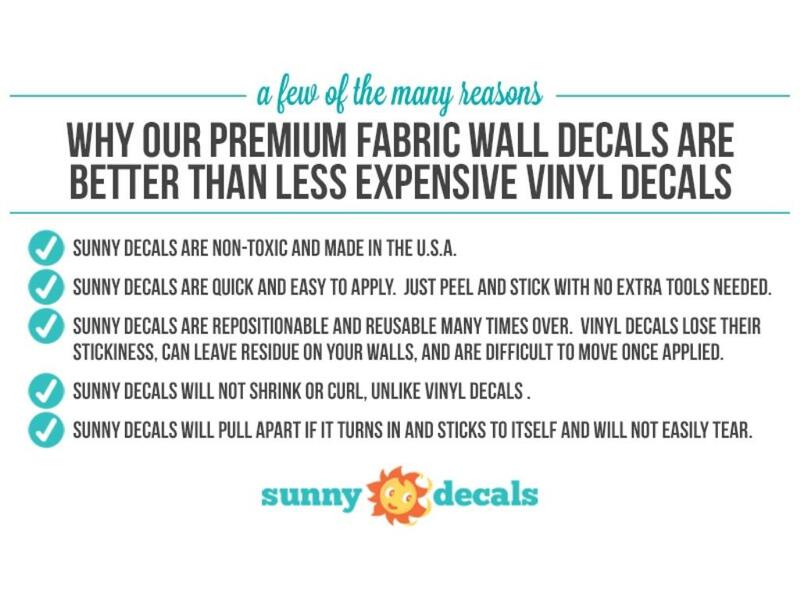 If you are not completely satisfied with the product, then you can return the decals to us for a full refund. You will be asked to mail it back unused, in the original packaging, and resalable condition within 30 days. Once the return has been received we will refund your payment less any shipping charges. If you received free shipping then we will deduct the shipping fees we had to incur to ship the decals to you. We reserve the right to refuse returns or exchanges if these conditions are not met.